When it comes to finding the perfect watch, there is no ‘one size fits all’. Watches are very personal and reflect the wearer’s preference; picking the timepiece that will best complement your personality – or the personality of that very special person in your life – is crucial. From sporty timepieces to sophisticated chronographs, we stock a vast range of watches that are suited for everyday wear, as a dress piece or as a companion to your favourite sport. It can be a challenge to find the perfect watch amongst such variety, so we’ve picked a selection that we believe is perfect for the modern gent. This timepiece is a fitting tribute to the iconic 1957 Superocean model, which was created to equip professional and military divers. Today, the Superocean is a popular choice among leisure divers and watch aficionados, as it comes with a water resistance capability of up to 200m and a rubber strap with the option of steel ‘Aero Classic’ bracelet. According to Breitling, this watch is ‘the perfect partner for adventure’. The stainless-steel case houses an officially chronometer-certified self-winding manufacture calibre and the stylish rose gold unidirectional scratchproof ceramic bezel truly elevate this timepiece to another level; especially when combined with the stunning contrast of the black dial with the rose gold batons and hands. 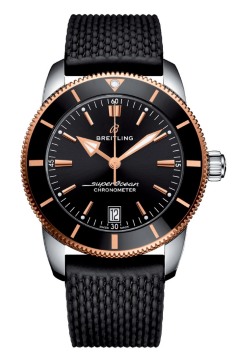 Technology and precision blend with stunning aesthetics in this Breitling Superocean watch, which is available at Banks Lyon for £4,520 or from £75.33 per month on 0% finance. 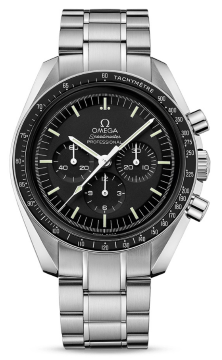 This is one of Omega’s most iconic timepieces. As the original Omega Moonwatch and having been a part of all six lunar missions, the Speedmaster truly represents the Swiss watchmaker’s adventurous pioneering spirit. The movement in this watch is the legendary mechanical calibre 1861 Chronograph, a truly superb manual-winding movement that was worn on the moon all six times. It features a black dial covered by hesalite crystal, a black bezel with a tachymetric scale, and a durable stainless-steel case. This Omega timepiece is beautifully presented in a special Moonwatch box and comes with a “NATO” strap, a tool to change the bracelet and a book that highlights the Speedmaster’s adventurous past. The Omega Speedmaster Moonwatch is the epitome of elegance and ideal for those who appreciate heritage combined with perfect precision. This watch is available for £3,520 or from £58.67 per month at 0% finance. Another timepiece with a rich heritage. IWC is well-known for creating innovative, state-of-the-art watches with a focus on gorgeous design and outstanding craftsmanship. The brand’s pioneering spirit is reflected on its Big Pilot’s watch, which houses an IWC-manufactured fast beat (28,800 vph) automatic chronograph with a 7-day power reserve and is water resistant to 6 Bar. It features a Pellaton automatic winding system with black and white ceramic parts, as well as a Santoni black calfskin strap with iconic studs. Sapphire crystal protects the black Arabic dial and comes with an auto-reflective coating to prevent glare. The date complication is powered by the superb movement of this timeless piece. 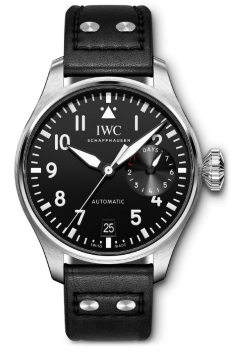 Classic and yet forward-thinking, the IWC Big Pilot’s watch is available for £11,450 or from £190.83 per month on 0% finance. Cartier is renowned for crafting precise yet incredibly stylish and classic timepieces, and the Santos range is no exception. This iconic model also comes with a strong history, as the original watch was created by Louis Cartier for his friend, Brazilian aviation pioneer Albert Santos Dumont, who didn’t want to fumble for his pocket watch while flying a plane. The latest version of the popular Santos “Tank”, now with a large 39.8mm case and water resistance to 100 meters, remains just as timeless as ever. It’s powered by a mechanical movement with automatic winding and features a steel bracelet with 18ct yellow gold screws, as well as a “SmartLink” resizing system; the bracelet is also available in just steel. By purchasing this watch, you also get a second strap in calfskin leather with a steel double adjustable folding buckle. 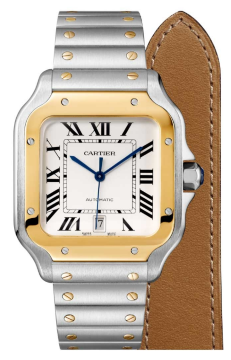 Perfect for the fashionable man who prefers a classic piece that can complement any wardrobe, the Cartier Santos is available at Banks Lyon for £8,900 or £148.33 per month at 0% finance. This exclusive watch is truly a masterpiece. 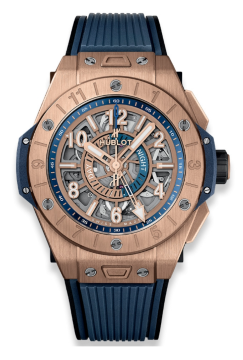 A stunning chronograph with a skeleton and blue-coloured face, it comes with a satin-finished 18ct King Gold case and houses Hublot’s Unico 72-hour power reserve automatic chronometer GMT movement. This gorgeous watch is truly the “culmination of an haute horlogerie manufacture”. The Unico movement stands apart for its incredible technology and construction; it took four years to develop and possesses 330 individual components that were assembled by hand. This movement can also be fitted with other complications and modules, such as the Flyback Chronograph, GMT or the Bi-Retrograde Chronograph. Ideal for the modern gentlemen who appreciates superb craftsmanship, precision and style, this Hublot Big Bang model is available for £33,900 at Banks Lyon. Banks Lyon is the official stockist for many luxury watches on finance, so you can be confident of finding the perfect timepiece with us – be it for a loved one or as a gift to yourself.